Early on in the Summer I was looking into a humidifier for the health benefits, being that I was ill within a couple of months of each battle round of flu, I wanted to be able to breathe at night because my bedroom is probably one of the warmest in the house. Upstairs is already pretty warm due to heat rising, we've also got insulation in our walls of our house to keep the heat in and in my bedroom, I've got the hot water boiler and hot pipes. My bedroom is the medium sized room but there's not much room so you can only imagine, when it gets warm, it really gets warm. My bed is right by my radiator and the hot water tank is on the other side so I sit & lay in the middle of warmth. Not to sound ungrateful but who wants to age and be stuffy constantly because of central heating abuse? 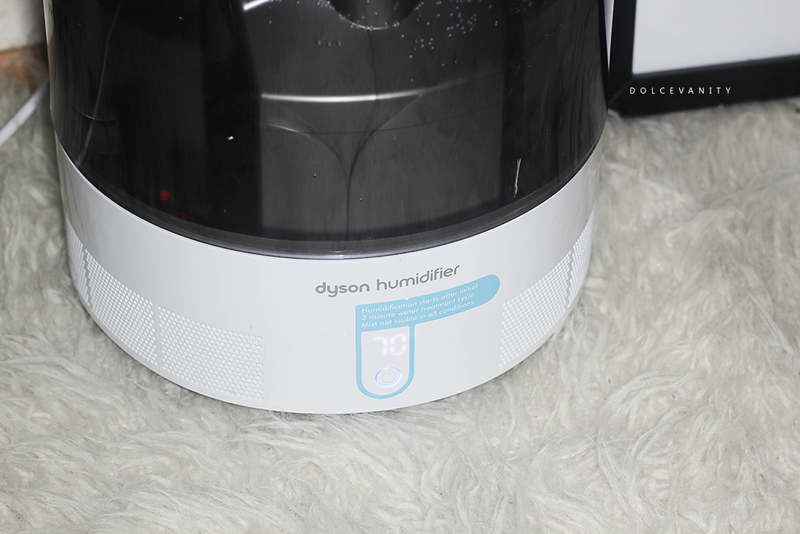 When I was first made aware of the new Dyson Humidifier it made me see another humidifier on the market but they also pointed out the beauty benefits as well as the health benefits. We all know that central heating reeks havoc on our skin and hair by sucking out, all the moisture in the air. We then go outside, the cold chips away at our skin and even while in cars, we want the warmth but that's more dry air. Although it's cold, we're also combating heat too, all day and our skin & hair don't know how to act, besides with just dryness and irritation. Let me not forget it's flu & cold season. Humidifiers put back the moisture in the air that you're losing due to warm/low humidity conditions. Unlike products such as cooling systems such as air cons that lower the humidity in the air or central heating in the home that creates dry air. This humidifier is scientifically proven to hydrate dry air for a healthier environment. Ideal for adults, children, newborns and allergy sufferers by maintaining the correct level of humidity within your home. It's the first humidifier to meet asthma and allergy friendly standards. The world’s first humidifier to receive dermatological accreditation from the Skin Health Alliance. Hydrate your home as well as helping retain your skin's natural moisture. Dyson engineers have invented a way to hydrate air hygienically, evenly and quietly. Human skin is made up of three core layers subcutaneous fat (lower layer), dermis (middle layer) and epidermis (outermost layer). The stratum corneum, which is in the epidermis, is made up of dead keratinocytes (90% of cells in the epidermis are keratinocytes. Which multiply and migrate upwards from the basal cell layer) . It's within this layer that, in healthy skin, effectively provides the skin's barrier function, regulating water loss from tissue inside the body & preventing irritants and substances from the external environment from spreading throughout the skin. 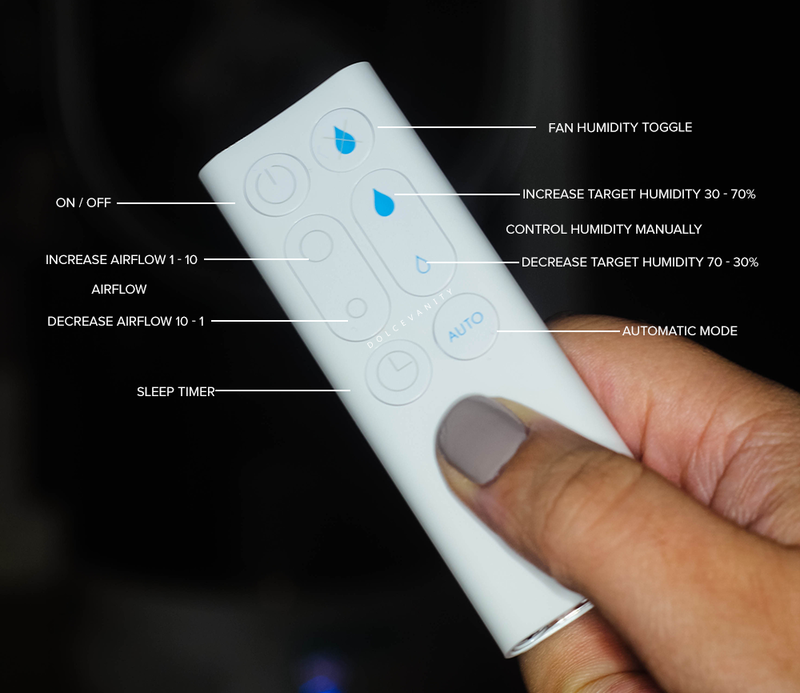 Remote ControlIt has a remote control included with the humidifier, if you're relaxing sometimes the last thing you want to do is get up every time to adjust the humidity, turn on the fan or even switch it off, you can do it all from a comfortable position. Humidifier‣ 10 fan speed settings to adjust and also 9 humidity settings (30 - 70%). ‣ The humidifier will not operate unless the target humidity setting is above the current room's humidity level. It'll adjust automatically to avoid excessive humidity. I have noticed the mist a few times, in certain lighting and against darker backgrounds. I notice it more when it's on the lowest setting. Gives me reassurance my new baby is working. ‣ Automatic mode is recommended due to the fact it'll target what the current room needs so you get the best out of it. 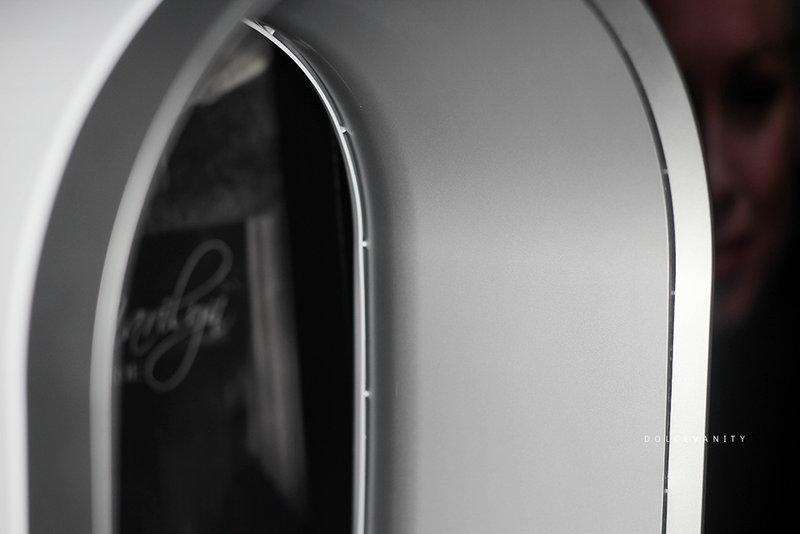 Once it's reached an appropriate humidity level you'll find it adjusts and will switch itself ON or OFF to maintain. The fan will still run when the target level has been reached. There's also a fan (solo) option, I'm ready to put my other fan away. ‣ When selecting fan mode, the blue light that indicates the humidifier is on, will now turn white. This gives a nice cool breeze, consistently, unlike fans that begin to blow warm air after working for awhile. ‣ 10 speed settings. Water isn't used for this feature. Ultraviolet Cleanse™ technology‣ Antibacterial technology, kills 99.9% of bacteria before the mist is projected into the room by exposing every drop of water to an ultraviolet light. No bacteria is harboured in the water unlike others on the market. 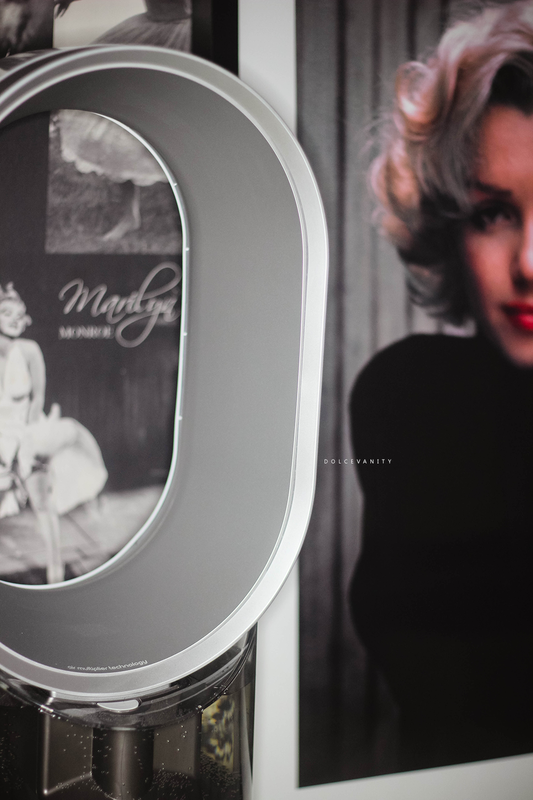 Dyson have officially branched into the beauty sector. Who'd have thought it? Before setting it up think about where to put the device, Dyson advise to put it in a corner of a room facing towards the middle, I'm guessing so the moist air can spread outwards evenly. Best bets is to place it near a cooling or heating device that way the air can circulate effectively. Being my room isn't too flexible with that option, I put it near my door where the air can go towards the centre of my room. - If this is moved while operating, it'll temporarily stop operating as the surface is 'unlevel', just as if the surface it's placed on isn't level, it won't work at all. Filling the tap is simple. There's a white button that'll release the loop from the tank, then the tank from the white lower base. There's a red cap that you screw and remove and that's where you fill the tank with cold water (DO NOT add oils, scents etc.) to the top. Once filled, replace the cap, to carry it back to the base, use the handle provided for easier handling. Replace the tank to the base and the loop. Press the ON button and it'll light up blue to indicate humidity mode. Give it 3 minutes and it'll start to humidify. A piezoelectric transducer in the base of the machine, vibrating up to 1.7 million times a second, breaks the water down into microscopic particles, these are then drawn up through the loop amplifier and projected through the air using Air Multiplier™ technology. Above is a close up of the air gaps. I start it off on the auto feature because it gives the best humidity, if my room is pretty warm it starts off at the max which is 70 and gradually it comes down over time as the air in the room becomes more moist it comfortably adjusts itself to around 35 - 45%. 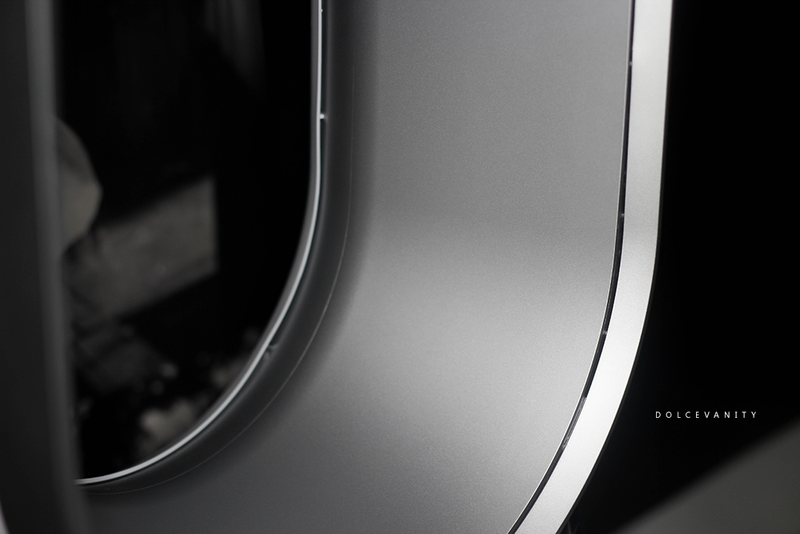 It's able to measure both the temperature and moisture in the air by using an Intelligent Climate Control. Most use for me is in the evening and just as I'm falling asleep I put the timer on for around 45 minutes and drift off, the humidifier is quiet enough for me, especially when the fan is set to low, it's got a calm breeze effect that comes from it. Why I feel I can tell you this 100% works for me is because at the moment, weekly, I am using a dermaroller, that alone makes the skin very dry for the following couple of days afterwards as the skin is repairing itself but no amount of dry skin emollient has worked. Until, I noticed my skin isn't as dry as it use to be when using the dermaroller prior to using the humidifier. Warm air prior as I slept, took away anything needed to soothe the skin, the dryness of the skin after the dermaroller was deterring me from using it anymore but after the past few weeks I noticed it wasn't happening anymore. When I wake up my skin has a different texture which I expect but the uncomfortable dryness was gone and I honestly put it down to the humidifier, helping my skin retain the moisture it needs to heal. It's become absolutely beneficial to me. I feel blessed and thankful to have it as it has helped my room conditions which in turn has began to benefit my skin, breathing and possibly my plants (they weren't surviving well). It can be used all year round and also be used elsewhere in the home to benefit others if need be. But to keep the machine working there's of course cleaning duties....womp!! Weekly you do need to clean it, run over the air slots, empty the tank, rinse and wipe over the tank & also wipe the base dry if there's any spillage. For the monthly clean, which I'm nearing too, you need Citric Acid which you can get off Amazon or eBay. Congrats for reaching the end of this post, I wanted to give you as much information as possible. Have I sold it? - My mum already asked me to get her one for Christmas. Are you interested? 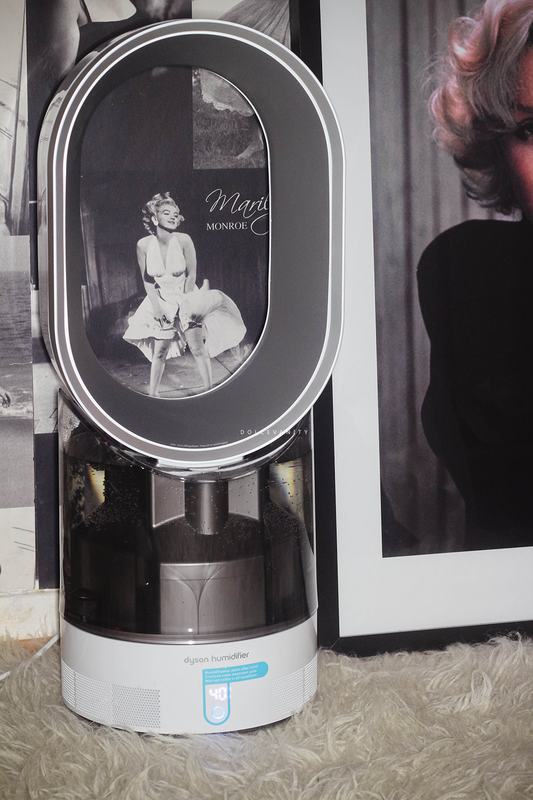 Have you ever thought about a Humidifier for skin and hair benefits? Have you or are you currently using one? It's very important to read the manual. The appliance and the remote control both contain magnets, so you don't want to place them near anything such as credit cards, SD cards, phones or any other media storage device. also if you or anyone in the home has a pacemaker or defibrillator avoid putting the remote in a pocket or on top of the appliance. You also don't want to place this appliance near electrical sockets as you can imagine, the moist air being distributed directly near it, would be dangerous. Hmm really interesting post! I have never used a humidifier before, except for my violin. But I have dry eyes, so it really could do me some good! Very fancy machine. Very fancy indeed. Looks like something I may want to save up for. This sounds so interesting and I love that it comes with the remote control. It's waaaay over my budget though! My nan has one and I find it awesome and worth investing in! I am using this Dyson humidifiers in my home and i can say this is the best one in the market. I have tried other companies as well but this one works really good.